Happy Thursday everybody. Here are a couple throwbacks from not far back. In fact these photos were from the fall of 2015. The first photo is of me and Tanja Bechtler performing at the beautiful Mint Museum in Uptown Charlotte. The acoustics in the Mint are a musicians dream. 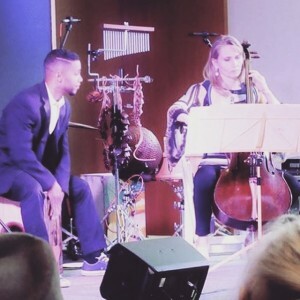 Tanja Bechtler performed on her 18th century cello. The tone on that instrument is incredible and it was a pure delight to witness her masterful playing from up close. The photo below is from the television interview I was privileged to give to promote the concert along with Tanja and classical guitar virtuoso Aris Quiroga. 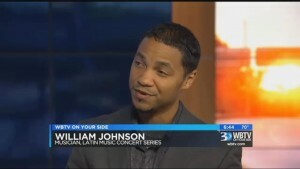 I was honored to be invited by Aris Quiroga and perform in such an illustrious night of music right in the heart of bustling uptown Charlotte. If you are ever in the Charlotte area I highly recommend visiting the Mint Museum. The third photo is me in my studio presenting a project I recorded percussion on. 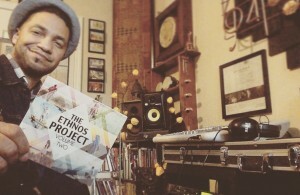 The Ethos Project Volume II was produced by Eric Lige (San Diego, CA) and Vahagn Stepanyan (Armenia). I will be posting a review on the project via the Heartbeat for Worship soon. Currently I am working on my new project as well as helping to produce a project for a dear friend Joe Keen. I am excited about what 2016 will bring. Until next time!